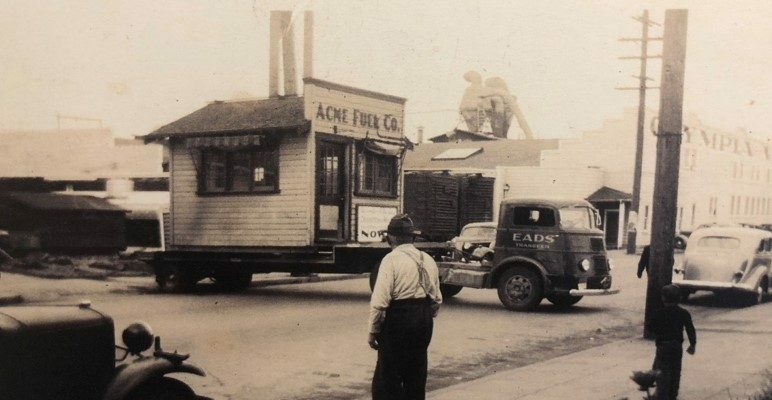 Did you know that the Acme Fuel office has been at the same address (416 State Ave NE) since the very beginning in 1925? The original office was one small room (smaller than a “tiny house”) and it was brought in on a flatbed trailer. This month I thought it would be fun to break out of our normal newsletter information and do some Acme Trivia! I will try and “educate” all of you on things that I hope you find interesting in our business. If there is something I miss that you’ve always wanted to know, send us an email or give us a call! The first thing I like to let people know, is that “Acme” is actually a Greek word; it isn’t an acronym (ACME – A Company that Makes Everything) as made popular by Wiley Coyote! Acme has not only survived, but we continue to thrive. The reason for this is we have evolved and adapted to the changing energies used over the years. We started out selling wood and coal. Then heating oil was our biggest business (and we still sell quite a bit of it). In the 1970’s we even sold beauty bark and insulation! In the 1980’s we opened our Fast Fuel gas stations which we continue to operate and grow today! In the early 1990’s, we expanded our service division to include the installation and service of natural gas equipment and heat pumps. In 1996, just after I came back to the family business, we began selling propane. Now propane and our Fast Fuel stations continue to exhibit strong growth for us. We are always keeping our eyes open for the next evolution of the business! Well, that’s just a small bit of trivia and history of Acme Fuel. If you have never been to our office, swing by sometime. We have lots of pictures showing many of the things I have written about here!